The mystery of Santa Claus and the anticipation of what surprises would fill my Christmas stocking were huge contributors to the mood of excited, noisy chaos that filled our home on Christmas Eve. I felt something almost magical when I carefully positioned my empty and flat Christmas stocking in its place on the couch – in line with those of my brothers and sisters – knowing that in the morning I would find it lumpy, bumpy and filled with presents, candy and an orange in the toe. Settling down to go to sleep was almost impossible for all of us. We could hardly wait for morning! 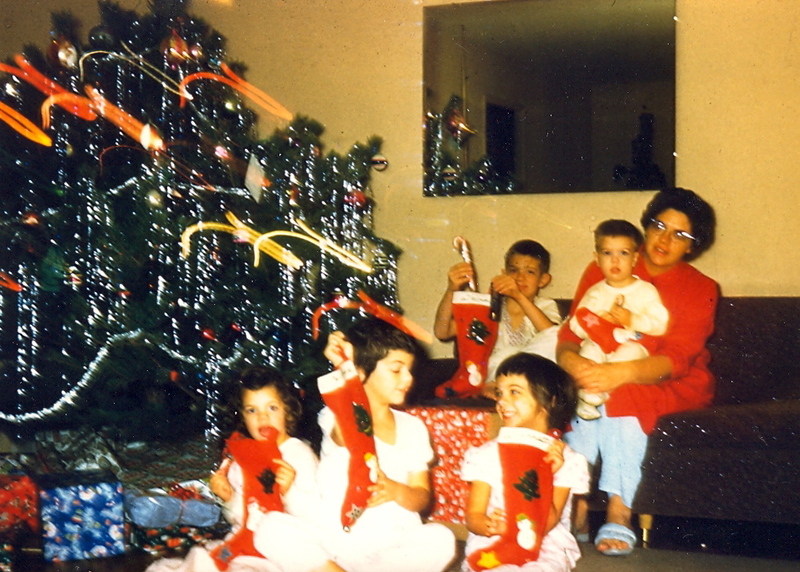 I think it was 1959 when my mother made Christmas stockings for each of us six children. After cutting them from red felt – with pinking shears, of course – she decorated each stocking the same. 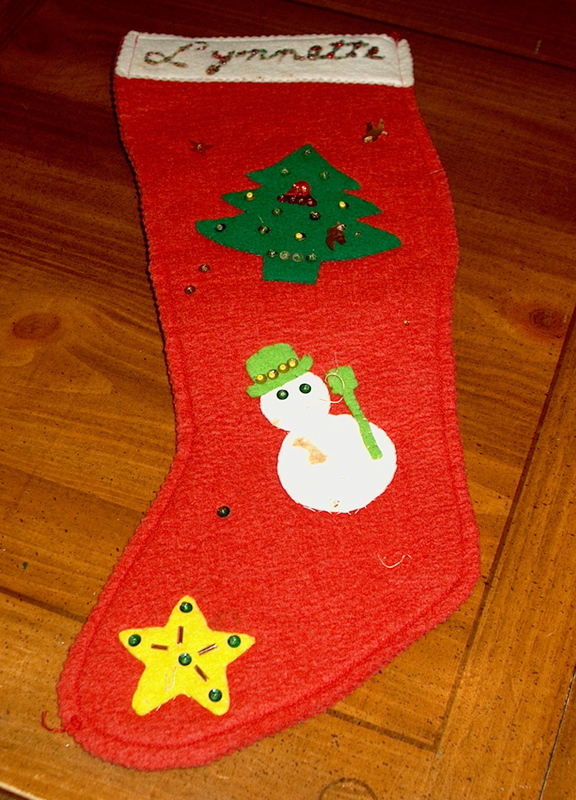 Shapes of a Christmas tree, snowman, and star were carefully sewn to the front of the stocking and then further trimmed with sequins and beads. On a strip of white felt at the top of the stocking she wrote each of our names in glue and then sprinkled red glitter over that so that individual ownership was sparkling clear to Santa. The jingle bell sewn to the toe of the stocking was just the right finishing touch, and we sometimes imagined we heard those bells jingle when Santa was at work. . . I have put out that same stocking every Christmas since then. The snowman no longer has a mouth, the hanging loop has been torn off, and the bell went missing years ago. The glitter is patchy, but the name is still readable – Santa still fills it every Christmas Eve. In December of 1972 I was a freshman at BYU dating Don Butler and wondering what would be an appropriate Christmas gift for my new boyfriend. Deciding to go the “not too serious, but still casually personal route,” I made a red felt stocking, filled it with a variety of little gifts and treats, and then gave it to him somewhat nervously. That stocking was a success that year, and has been hung every Christmas during our 37 year marriage. His name, spelled out in bold blue letters (no glitter here), leaves no question about ownership. 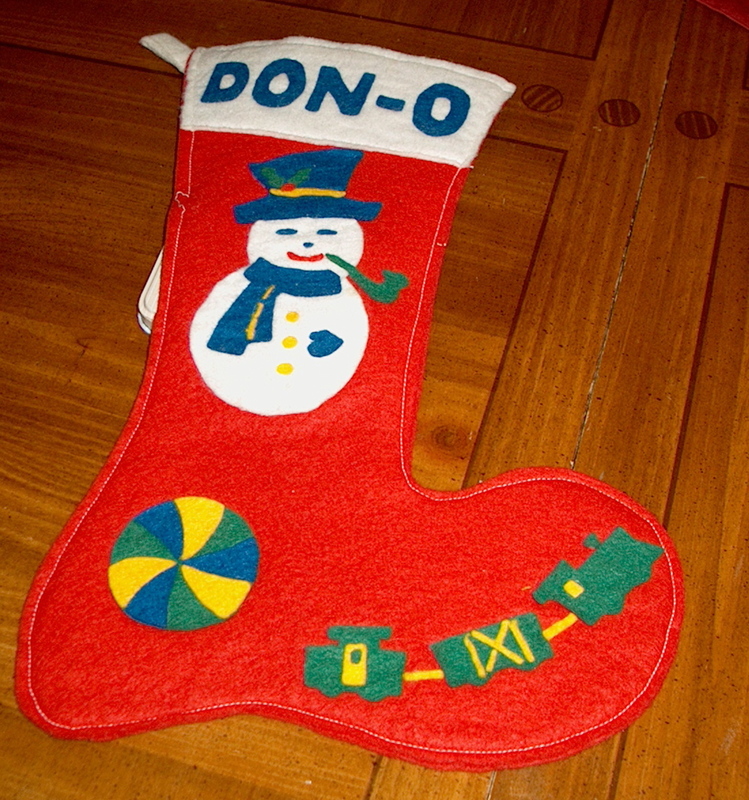 Like my 51 year old stocking, Don’s is also showing its age, but Santa makes sure that it is never neglected. Even as an adult I find it difficult to sleep on Christmas Eve. Yuletide excitement is a potent caffeine, no matter your age. Long ago I made Bruce one to match my original. The two of them go on the couch every Christmas and somehow they both get filled by Christmas morning! Thanks for the memories. And thanks, Mom, for starting it all.